looks like a happy baby! we always eat breakfast burritos and watch cartoons with the kids.....and i look at blogs...yay! OK, that's pretty much the cutest little one! We don't really have weekend traditions, but we do have a couple things we do a month on the weekends that are traditions, does that count? I hope you have a wonderful Sunday! Adorbs! When I'm home, my dad I usually eat lunch at the same place on Saturday & we always play baseball with the pup in the evening. 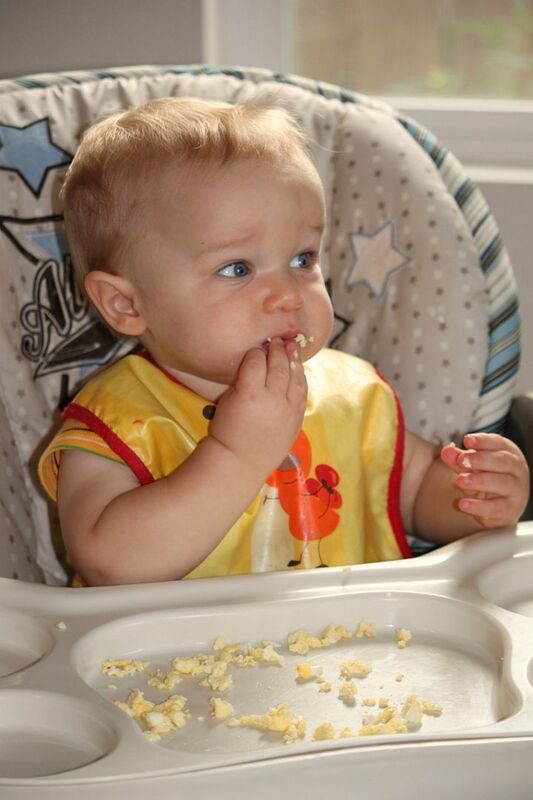 I love how cute max is with a mouthful of eggs. Adorable! We don't have any weekly traditions but does our annual winter vaycay for just the two of us count? I'm always trying to start something new! Sounds like the perfect breakfast/morning tradition!! :) And he sure is loving it, lol. Stopped over from FTLOB. Have a great one! I don't have any weekend traditions, thats so cute though :) Little cutie seems to approve. I love a hot cup of tea at my kitchen table on Saturday mornings...while I read blogs! Is that nerdy or what? Hello. I have just started following your blog - love it, especially your skincare tips! On Sundays mornings, I always cook my husband and step daughter pancakes for breakfast. She loves to set the table and decorate it with flowers. Such a great way to spend a morning. Weekend traditions equal a strong family..... I LOVE that! Such a fun thing to look forward to every weekend! Such a sweet boy you have! Isn't it frustrating to delete posts by accident? It's happened to me a few times too. We do pancakes every Sunday and the kids especially love it. As for traditions, I love to grab my bible and a few magazines, head to a local coffee shop and treat myself to some chillax time. We always have a fancy breakfast on Sunday morning-usually cooked by my husband. He makes buttermilk pancakes from scratch, or french toast from homemade bread. There's nothing better! What a cutie.My tradition is to sleep in:) I love sleep too much! Sorry to hear about te deleted posts, darn that wine! Oh my gosh what a fun tradition! I have no weekend one other than going to church! But that sounds like a good one- I love scrambled eggs! Thanks for stopping by my blog too :) Oh and I'm SO sorry you deleted a few posts- that is horrible ahhh! Ha. Family traditions are the best! I love that sense of continuity and something you can always expect to be there. My tradition is to bake some big casserole or chicken dish every Sunday night, to last me through the beginning of the week (I live alone). It makes the usually-rushed beginning of the week much calmer! hmm lately baked beans and toast! And my hubby tickles our 5 week old baby boy to get smiles out of him and I happily snap away! From a blog you may enjoy! I just love family traditions - especially weekend ones! We try to do pancakes on sat morning & have some fun activity planned that gets us out if the house ( otherwise we go crazy!). How cute is your little guy?! And I'm so bummed about your post loss - I can totally empathize! Oh my gosh what a gorgeous little boy!!! He has the bluest eyes! Awww, what a cutie pie!!! Oh, bummer about the deleted posts! How frustrating. 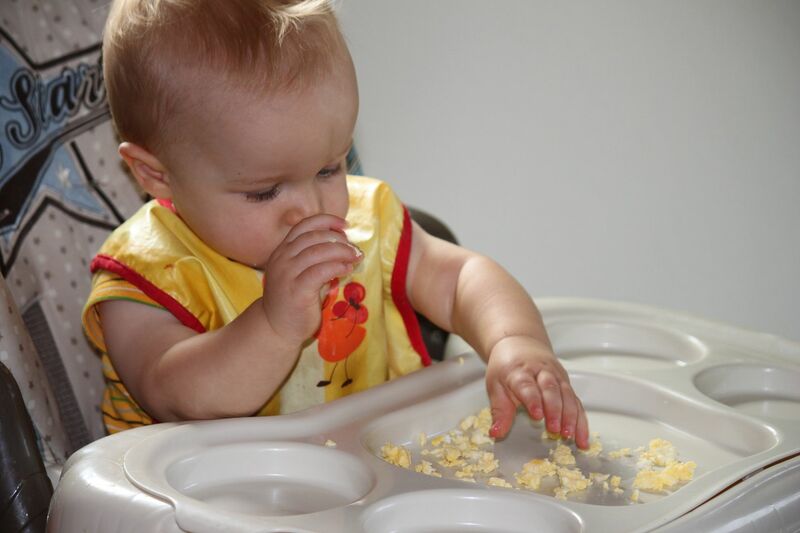 And yes, scrambled eggs are always such a treat! Oh Lindsay. Can Max get any cuter? How gorgeous is he? Sorry to hear about the deleted posts. My bf and I have a Sunday tradition of scrambled eggs and coffee breakfast followed by visiting Sunday markets. p.s Max is SUCH a cutie. I love family traditions! I've already made a list that I want to start when my me & my hubs have children! I am laughing about your wine-cident. Sounds like something I might or might not have done. going to the farmer's market and getting some milk! but when i was growing up, it was making scrambled eggs with my dad after church. hopefully will be able to do that again in a few years.